Operating a large commercial fishing boat is expensive, and lobster fishermen can only afford to check their sunken traps every three or four days. So Vince Stuart, a Nova Scotian inventor, created the Bait Savour which releases extra bait in the interim, increasing their haul. When a lobster trap is first sunk, it's loaded with bait that attracts crustaceans. 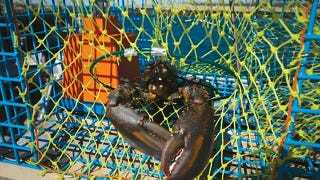 But the first lobsters to be captured keep eating the bait until it's gone, leaving no incentive for others to enter the trap afterwards. So using a specially-designed lock that biodegrades in water over time, the Bait Savour is placed inside a trap and will release an extra supply of bait a few days later. With a projected price tag of around $50 once it goes into production, the Bait Savour not only results in a greater haul by attracting more lobsters, but it also means fishermen can check their traps less frequently. And only having to make their rounds every five days, instead of three or four, saves them considerable time and labor and fuel costs over an entire season. Vince is going to be a very rich man. And our nation's lobsters are going to be very, very nervous.